Volodymyr Viatrovych was the driving force behind new laws that restrict free speech and regulate how history is written. Since the Maidan uprising and the subsequent attacks on Ukraine’s sovereignty and territory by Russia and Russian-backed rebels, there has been intense debate on how to interpret not only Ukraine’s dramatic present, but also its complex and difficult past. Against the background of military and diplomatic struggles, the representation of Ukraine’s history is also embattled, especially the period of World War II. Russian elites have labeled anything and everything they do not like about past and present Ukraine as “fascist.” Partly this is a reflex due to the memory of right-wing Ukrainian nationalism during the first half of the twentieth century; partly this is the result of a failure to find any better way to express anger at Ukraine’s turn to the West. There has been no shortage of Western commentators attacking this crude propaganda. However, among representatives of Kiev’s new post-revolutionary elites, unbiased engagement with Ukraine’s past has also been a challenge. But while the West is pillorying Russian distortions, it is much less at ease criticizing Ukrainian ones: Few Western observers feel sympathy for Putin’s involvement in Ukraine (I myself have none). There are many, however, who seem to welcome any historical narrative ruffling Russia’s feathers or appearing “pro-Ukrainian” or “national” (in reality, quite often nationalist), as the nation is facing outside aggression and domestic crisis. Yet this form of “support” is a disservice—to Ukraine and also to the West’s public and decision-makers. It is alarming that some Western journalists, scholars, and policy-makers are embracing a nationalist version of Ukrainian history that resonates only with part of Ukrainian society and not at all with serious academic discourse in Europe and North America. Front and center in the efforts to produce a nationalist version of Ukrainian history is the former director of the country’s secret-police archives (SBU) and new director of the Institute of National Memory (or UINP) under the current government of President Petro Poroshenko: Volodymyr Viatrovych. Viatrovych (born 1977), from the western Ukrainian city of Lviv, first stepped onto the national scene when he was put in charge of the archive section of the newly created Institute of National Memory in 2008 and then head of the SBU archives later that year. In these influential positions, he helped in the effort to “exonerate” a key World War II Ukrainian nationalist leader of any complicity in the Holocaust; presented the nationalist Ukrainian Insurgent Army as a democratic organization open to Jewish members; and focused heavily on Ukrainian victimization during the famine of the 1930s (while, interestingly, also blaming Jews as perpetrators). What unifies his approach is a relentless drive to exculpate Ukrainians of any wrongdoing, no matter the facts. Viatrovych has made a name for himself as a political activist by instrumentalizing his scholarly credentials. Both before and after his secret-service archive tenure, he was the head of the Center for the Study of the Liberation Movement (or Tsentr Doslidzhen’ Vyzvol’noho Rukhu, TsDVR) in Lviv. The research center is funded by private money from Ukrainian groups abroad that have helped shape its research agenda. The unambiguous goal of the center is to paint the Ukrainian nationalists, in particular the OUN and UPA (two of the most important Ukrainian nationalist organizations from the interwar and World War II period), as “liberators” from Soviet, Polish, and German oppression. 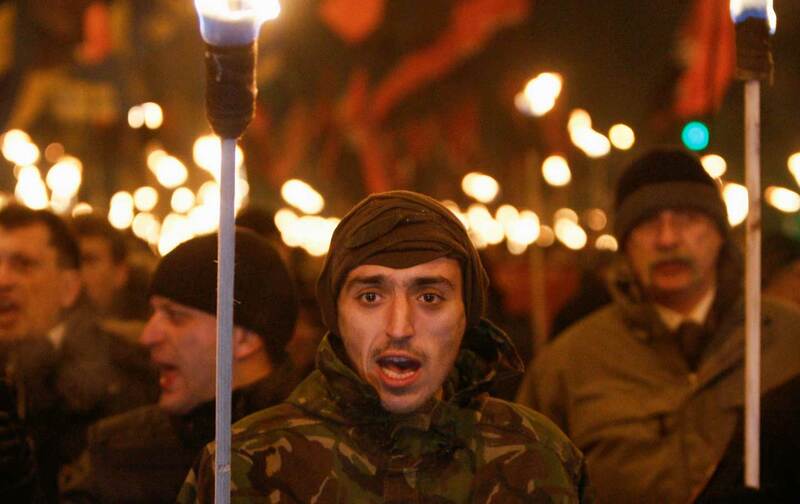 Radical right-wing Ukrainian nationalists are depicted as nothing but tragic freedom fighters, occasionally forced to don Nazi uniforms to struggle for independence, liberty, and Western values. This is the party line at the center, one largely shaped by Viatrovych. Viatrovych’s own “scholarly” output echoes the goals of his center. In a number of publications he has covered a laundry list of flashpoints in 20th-century Ukrainian history, from the vicious anti-Jewish pogroms of World War I through Ukrainian-Polish violence during and after World War II. What unifies his approach is a relentless drive to exculpate Ukrainians of any wrongdoing, no matter the facts. For example, concerning Ukrainian nationalist involvement in the Holocaust, in Viatrovych’s world, collaboration never happened or was coerced and, at any rate, can’t be blamed on nationalism; all evidence to the contrary is blithely assigned to Soviet lies. On the nationalist ethnic cleansing of Poles in 1943-44, Viatrovych lets us know that that was a sort of tragic but symmetrical warfare. And as we all know, war is cruel and bad things happen. When confronted with the fact that the head of UPA, Roman Shukhevych, served the Nazis until 1943 as commander of a mobile police battalion that murdered thousands of civilians in Belarus, Viatrovych responded: “Is it possible to consider Poles or Belarusians a peaceful population, if, during the day, they work as ordinary villagers, only to arm themselves in the evening and attack the village?” In other words, civilians are fair targets, especially for “heroes” of Ukraine in the service of Nazis. In the academic world, such tactics have their limits. But when confronted with solid archival evidence contrary to his stories, such as orders from OUN-UPA leadership to cleanse the Polish population of Volhynia, Viatrovych simply claims that documents are Soviet forgeries or that scholars challenging him are serving sinister propaganda purposes. Selectivity rules: If there is no smoking-gun document for nationalist crimes, it’s exculpatory; when there is no smoking-gun document for premeditated Soviet genocide against Ukrainians, it’s a result of KGB cunning. Viatrovych deals with video testimonial archives and the integration of witness testimony into history with bravado, simply ignoring them (and especially Jewish voices) altogether when he dislikes what they have to tell us. This abysmal ethical and methodological approach has been challenged by scholars from Poland, Scandinavia, Germany, Canada, and the United States, in addition to a few brave Ukrainian ones. These scholars have written excoriating reviews of his works. Unlike his writings, these reviews were published in peer-reviewed journals. There are no career repercussions for poor scholarship when you are a political activist. Thanks to his credentials as “former SBU archive director,” director of a prominent “research” institute, and a brief stint as a research fellow at the Harvard Ukrainian Research Institute (HURI), which show up in every bio-blurb possible, Viatrovych is cited frequently in the Ukrainian media. Ironically, as he has gained more negative attention from scholars, he has traversed a different arc in Ukraine—increasingly trusted as a voice of wisdom, a young, fresh force promising to defend and promote Ukraine’s history, here understood as the glorious record of Ukrainian nationalism. It was no surprise when in late 2014 President Poroshenko chose him as head of the Ukrainian Institute of National Memory, a government body originally created by then President Yushchenko to support research and forge a national memory policy. Viatrovych wasted little time after this appointment. He became the driving force behind the so-called de-communization laws that were put on the books this spring. In reality, these laws regulate how history should be written and place restrictions on free speech, and thus are deeply at odds with Kiev’s claims to Western values. Law No. 2538-1, “On the legal status and honoring of fighters for Ukraine’s independence in the 20th century,” states that “the public denial of…the just cause of the fighters for Ukrainian independence in the 20th century insults the dignity of the Ukrainian people and is illegal.” The fighters for Ukrainian independence explicitly include the World War II nationalists of the OUN and UPA. In essence, this law makes it at least very risky to criticize them or point out the crimes in which they participated. As with similar Putinist legislation in Russia—namely Article 354.1, which criminalizes any deviations from the Kremlin’s version of World War II and was passed by the Russian Duma in 2014—the very vagueness of phrasing is a handy weapon of potential repression: it is a disturbing mystery how the state or other accusers are going to determine who insulted the dignity of violent ethnic cleansers and happy authoritarians or how the courts are going to prosecute those guilty of such thought crimes. Law No. 2540, “On access to the archives of repressive organizations of the communist totalitarian regime from 1917-1991,” puts all secret-police archives under the control of the National Memory Institute in Kiev, headed by Viatrovych. Sadly, the Ukrainian-diaspora scholarly community in North America has often supported these restrictive laws. These new laws have been criticized in a number of journals and magazines. Why they are deeply flawed should be obvious to anybody committed to even elementary principles of free speech and democracy. The reaction to the laws was predictable: first, there was a response from the Western academic community. Seventy leading scholars, including some from Eastern Europe, signed an open letter protesting the laws. Other organizations, such as the Organization for Security and Cooperation in Europe, the Kharkiv Human Rights Protection Group, and the United States Holocaust Memorial Museum warned of their dangers. Foreign media outlets also took notice. Yet, despite the outcry, except for a few articles by Western scholars, there has been little discussion of Viatrovych’s personal role in making the laws or the larger backdrop of aggressive history politics, going back to 2005. A few of the most prominent Ukrainian intellectuals provided commentary that half-heartedly condemned a crackdown on free speech, but they focused on questioning the attitude of Western scholars protesting against the laws. Other Ukrainian commentators have provided rather muted criticism of the laws, less because of the politicization of history and more due to issues of financial and privacy concerns. Only a few Ukrainian commentators did condemn the laws on principled grounds related to academic freedom and historical revisionism. Sadly, the Ukrainian-diaspora scholarly community in North America has often supported these restrictive laws. Regarding Viatrovych, they see no problem with having a partisan political activist in charge of the country’s secret-police archives; rather the foreign scholars and their “insensitive research” agendas that discuss the dark spots of Ukraine’s history are the real problem for Ukraine. In a recent roundtable interview with two well-known scholars and one member of the Ukrainian-American community, Western scholars were described as “neo-Soviet” and their response as “quasi-hysterical.” In a misplaced “post-colonial” twist, the “propriety or authority of foreigners to instruct Ukraine’s elected representatives as to whom they wish to acknowledge or memorialize and why” was questioned. The laws were praised as the answer to outside tampering in Ukraine’s history. On the issue of free speech, there was hedging. In an Orwellian key, Alexander Motyl, a political scientist at Rutgers University-Newark, went as far as to compare Ukraine’s history regulation laws to civil rights laws, women’s rights, and laws protecting the gay community in the United States. This is not the first time Motyl’s analogies to US history have caused shock in various scholarly communities. The naïveté with which some Western observers have embraced the nationalist narrative is even more troubling. There has been little controversy in the West about putting Ukraine’s secret-police archives in Viatrovych’s hands: the responses from Ukrainian intelligentsia have ranged from joy to muted concerns about privacy issues. Motyl excitedly called the archives law a “coup for freedom and justice”—unsurprisingly, given that he is perhaps the only scholar to have praised Viatrovych’s recent book. Outside of perceptive pieces in Ukrainian by Vasyl Rasevych, a historian and writer, and Stanislav Serhiienko, an activist and writer, about the dangers of archive tampering, few commenters, including those in the West, seem to worry about the potential manipulation of the archives. The dialectics of national liberalism aside, Motyl’s term “coup” is an apposite Freudian slip. We might ask ourselves why a nation’s most politically sensitive document collection should be entrusted with a political activist interested in one and only one version of the past, rather than putting them under the auspices of the central state archive administration. A while ago, when a Communist was director of Ukraine’s archival administration, Western observers were worried. The failure to worry when a nationalist defending the record of right-wing authoritarians takes over the national memory project and the secret-police files is disturbing. If the response from the diaspora-oriented scholarly community to the laws and Viatrovych’s appointment has been scandalous, the naïveté with which some Western observers have embraced the nationalist narrative is even more troubling. Following the Maidan revolution, Viatrovych is now cited as a voice of knowledge in the Ukrainian and Western media. The Christian Science Monitor has quoted him in an article about Ukraine’s past, where he explained that to dispel “myths” Ukraine should “create an open, national dialogue.” With no acknowledgment (or, probably, knowledge) of Viatrovych’s background as a myth-maker-in-chief himself, the article uncritically presents him as a voice for the future. Even more egregious was the article “Is There a Future for Ukraine?” by Peter Pomerantsev, a journalist and producer who writes frequently on Russia, which appeared in The Atlantic in July 2014. Pomerantsev interviewed and profiled Viatrovych as a carrier of hope for Ukraine’s future. Pomerantsev has managed to recognize in Viatrovych “a liberal nationalist,” working to “create a Ukrainian identity”—strange praise for a man claiming to be a scholar, a profession usually engaged in open-ended inquiry, not identity building. Pomerantsev tells his readers that Viatrovych is “best known for his work on reformatting Ukraine’s relationship to the Second World War,” which is both an understatement and a horribly revealing choice of terms. In his mostly uncritical portrayal, he writes that Viatrovych “believes he can help bridge these divisions [in Ukrainian society] and create a story that is at once nationalist and integrationist.” When asked about a positive unifying message, Viatrovych matter-of-factly tells him that Russians want “tyranny” and Ukrainians want “freedom.” Pomerantsev swallows this bigoted statement of frank stereotype about large populations with no response, since compared to the overtly racist Ukrainian nationalist he interviewed in the first part of the same article, Viatrovych comes across as less brutal. But perhaps also because “we” in the West now consider it good form to cut a Ukrainian nationalist more slack than a Russian. The commentary by Viatrovych himself on the laws he helped make is perhaps the most illuminating and troubling aspect of the entire debate. On May 1, he reacted to criticism with a statement packed with paradox. On the issue of academic freedom, he writes that the “laws…will not in any way influence academic discourse.” He adds that the laws will serve as a “powerful incentive for the de-politicization of the history of the OUN and the UPA” and “reanimate academic discussion.” How banning critical views of radical right-wing ethno-nationalists and their violent deeds represents a depoliticization of historical topics or supports academic discussion is beyond comprehension. In response to critics’ references to the crimes of Ukrainian nationalists during World War II, Viatrovych maintains that “this is only one of the opinions that have the right to exist.” He goes on to argue for the importance of nationalism in current Ukrainian culture because “partisan folklore includes hundreds of folk songs and is one of its richest among folklore sources.” These are the priorities of Ukraine’s new memory manager-in-chief: preserving folk songs (which, he may fail to realize, are not likely to all be genuinely “folk” or “traditional”) at the expense of difficult discussions about war crimes, the very existence of which is reduced to “opinions.” As for Viatrovych’s promise that the laws would not be used to intervene in academic debate, it only took about two weeks for the laws to be used to intimidate Ukrainian scholars: the education minister disseminated a letter to “patriotic” scholars of Ukraine, alerting them that it is necessary to respond to the allegedly Kremlin-directed Western scholars’ letter on the new laws. To be sure, the Russian aggression against Ukraine has forced scholars and other onlookers to take sides. Many Western observers, including this author, support Ukraine’s struggle for democracy and sovereignty. What parts of the Western media, academia, and public-policy world have failed to grasp is that supporting partisan political operatives self-spinning as “national liberals” and objective scholars will do nothing to further Ukraine’s cause. One would think we had learned a key lesson of the Cold War: that the crude calculus of “the enemy of my enemy is my friend” is wrong-headed. As for academic freedom, Ukrainians should have the opportunity to struggle with, write about, and argue over their own history in all of its glory and all its darker sides without threats, implicit or explicit. Part of this freedom would include cooperation and debate among scholars from many nations. Ukrainians do not need any more commissars to tell them what they are allowed to say or think, neither in the name of Communism, as in the bad old days, nor of nationalism. Moving forward includes leaving that paternalistic model behind for good. Jared McBrideJared McBride was recently a visiting assistant professor in the history department at Columbia University. He is currently a Title VIII Summer Research Scholar at the Kennan Institute. The opinions expressed in this article are solely those of the author.